Khadi Sweet Almond Oil, a must-have in every beauty bag. For my super sensitive, combination-dry, acne prone, occasionally patchy and occasionally oily skin, there are very few oils that work in making it glow without clogging the pores! Khadi Sweet Almond Oil is definitely one of them. 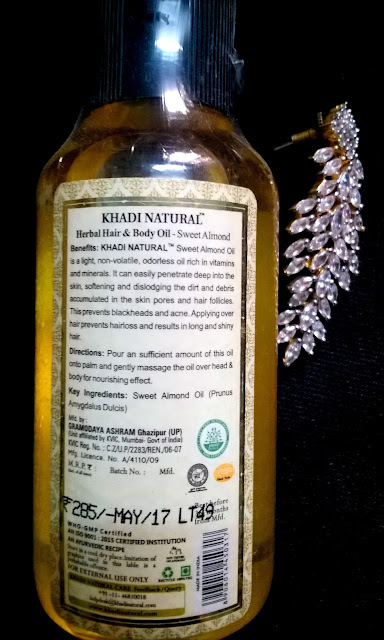 Packaging of Khadi Sweet Almond Oil is very basic and it does not feel very travel friendly either, especially its flimsy cap which is the same story for all Khadi products I have bought. Its Ingredients list simply says Sweet Almond oil. Claims to prevent blackheads, acne, hairloss as well as deeply soften and moisturize both hair as well as skin. It is available in Khadi stores as well as online on Amazon for around Rs. 600 for 210 ml. Quantity is good enough to last for 2-3 months as only a couple of drops are needed to apply it on skin as well as hair,by mixing it with other oils/face packs/body scrubs. I have found Khadi Sweet Almond Oil to be quite natural, does not have an artificial smell, it is neither very thick nor very runny, looks golden but when applied it does not have any tint. For my facial skin, I rely mostly on Ubtans and Forest Essentials Tejasvi Ubtan as well as Narangi & Nagkesar Ubtan are my favorite with most amazing glow, smoothness and softness imparted to my skin. So how I use Khadi Sweet Almond Oil is adding a couple of drops in my ubtan + yogurt mix and apply it on my face for 15-20 minutes every alternate day. I also make body scrubs/packs with multani mitti, besan, curd and add a couple of sweet almond oil there also. Both ways, I have seen that my skin is left moisturized perfectly, my skin is not patchy nor is it stretchy or extremely oily. This is best for combination as well as dry skin. Maybe very oily skin will not like this moisturizing aspect. 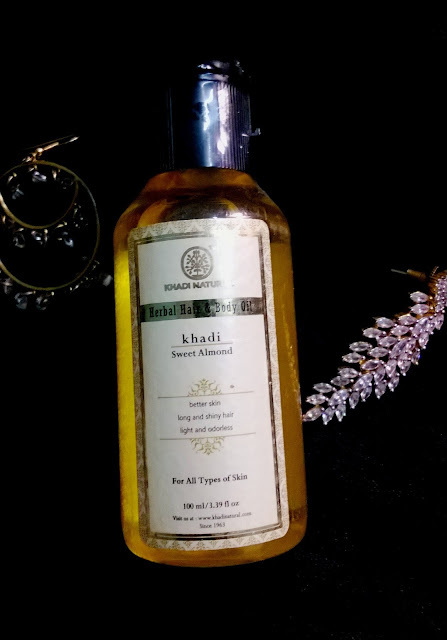 I have tried using Khadi sweet almond oil as a body massage oil too but my body skin is extremely dry so I actually prefer using other heavy duty lotions or creams such as Forest Essentials Nargis Body Cream. The good thing is that this sweet almond oil gets absorbed quite quickly and does not leave a stain behind on clothes. For mildly dry skin, this is a great massage option, especially during summers when nobody wants very creamy body lotions. Can be used on facial skin through ubtans or home made scrubs, same for body and on hair too. Completely multi-faceted. Have to say that after using it for over a month, I feel like my pores are clearer, not clogged at all. Quite easily available offline as well as online on Amazon, Nykaa etc.